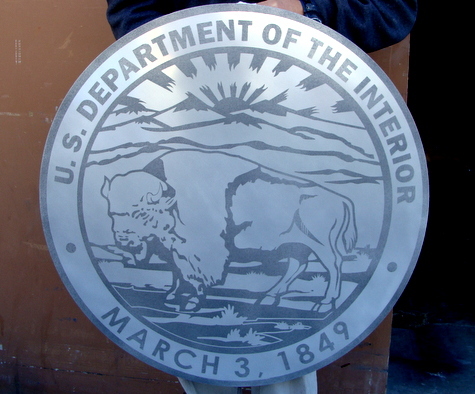 Above is a photo of a sandblasted aluminum wall plaque of the Great Seal of the Department of Interior. This is basically a 2D plaque with very little relief..The dark areas are sandblasted; then the entire seal is clearcoated. Aluminum is strong, will not corrode and will last a lifetime. This seal is 24 inches in diameter, but can be purchased in any size from 16 inches to 60 inches in diameter,It can also be customized with other text, art, etc. We can make this type of wall plaque for any design on our website. We can make a 2.5D (flat relief) or 3D carved and sculptured bas-relief (1/2 to 1 1/2 inch elevation relief ) High-Density-Urethane sign or wall plaque of any design in any size from 12 inches to 8 feet, for either indoor or outdoor use. Typical sizes are 18 , 24, and 36 inches in width. We can customize or personalize these plaques with carved raised or engraved text for individual or organization names, achievements, citations, dates, etc. These are suitable for outside building entrances, memorials ,informational displays, dedications, and also inside lobby or reception areas, hallways, courtrooms, conference rooms, offices, auditoriums, and podiums. We also make plaques for employee or citizen recognition, award, achievement, service , or retirement. Prices for these wall plaques vary widely with size and complexity of design. Please call us at 951-698-8484 or email us at info@artsignworks.com for design options, price quotes, and delivery schedule, and our knowledgeable and helpful Customer Service Representatives will respond to your requests promptly. We are proud of every sign we design and fabricate, and we are sure you will be pleased with your carved sign or plaque. To see prices or get Estimate and Order forms , click on gray boxes in upper left margin. Click on dark gray tabs on the header to see Home and other informational pages. Click on one of the light gray numbered boxes in the lower left margin to see other photo galleries. Other Federal agency plaques are shown in Gallery 31.